– Dan Barry, New York Times contributor, October 13, 2012. The Midwest is the center of my earth. The winds of the Great Lakes carry my family’s ties to the outer reaches of Erie, Michigan, Superior. Old farmlands hold their stories – of rejection, toil, love, and aspiration. My family has been in this land for four generations. My ancestry? The result of many great migrations. From the barren fields of Ireland, the balmy shores of Italy, and the mountains of Germany they came, to the harsh winters of northern Wisconsin, the great boulevards of midcentury Detroit, the iron-clad gates of churches in Chicago, and the old manufacturing towns of Ohio. I picture him in the kitchen in his house on 328 Eighteenth Street, science textbooks tucked in his all-of-a-sudden-large teenage-boy hand that he holds against his thigh. His dark black hair is combed back, at least it will be for a few hours, until football practice after class at Elyria High School. “Jovial, Faithful, Sportsmanly,” his old yearbook describes him as a young man at the time. Before grabbing an apple from a bowl on the table, he kisses his mother, my great-grandmother, on the cheek, her own black curl tucked near her ear. She is Catholic, southern Italian, and a damn good cook. She stirs fresh tomatoes into her personally crafted sauce, which will boil on low all day until her husband comes home at suppertime. James would not follow in the footsteps of his father. 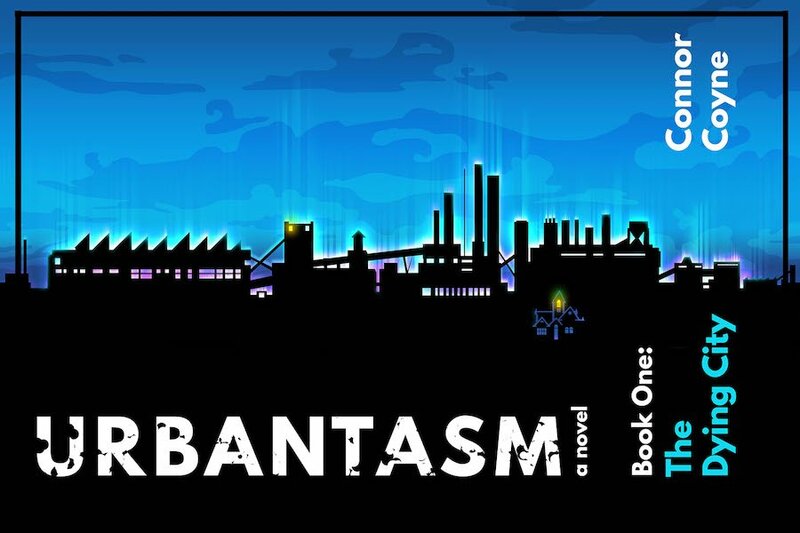 He did not want to work in a factory or a storefront in this small town. For him, the land of Elyria, Ohio, was limited. It did not feed his yearning to explore new frontiers of technology, to put his hands to work on the prospect of plutonium. Eventually he would play with the power of the atom for wartime, and then for research, science, and humanitarian uses of energy. They would test their product in laboratories built in the Ladies’ Room of the North Stands of Stagg Field, the athletic field of the University of Chicago. And the result would be delivered to Hiroshima and Nagasaki, and the inside of his biological cells, rooting themselves inside him until his death years later. For now, he would not stay to plant fertile fields of corn, or manufacture goods to be shipped by rail to the cities beyond his own town. No, he had to get out of Elyria. – Dan Barry, New York Times contributor, October 2012. On the morning after my twenty-second birthday I lazily stepped down the stairs of my historic apartment in Carlisle, Pennsylvania, and opened the door onto High Street. It was a Sunday, and unlike weekday mornings, when I was often overworked, underslept, grumpy, and late to class, I made my way lazily to the college cafeteria to eat a bowl of Cheerios. Like every Sunday, a pile of unclaimed, rolled-up copies of the New York Times splayed out across the landing of the stairs to the student center. After selecting a seat at an empty table and serving myself a bowl of cereal, I opened the pink plastic tube covering the Times and pulled out the thin newspaper onto the table before me. Immediately the front page struck me. 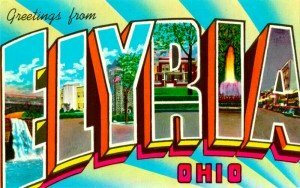 It was a feature about Elyria, Ohio, a place most Americans had probably never been or heard of. Why would they have? It’s a small, post-industrial town in Northern Ohio. 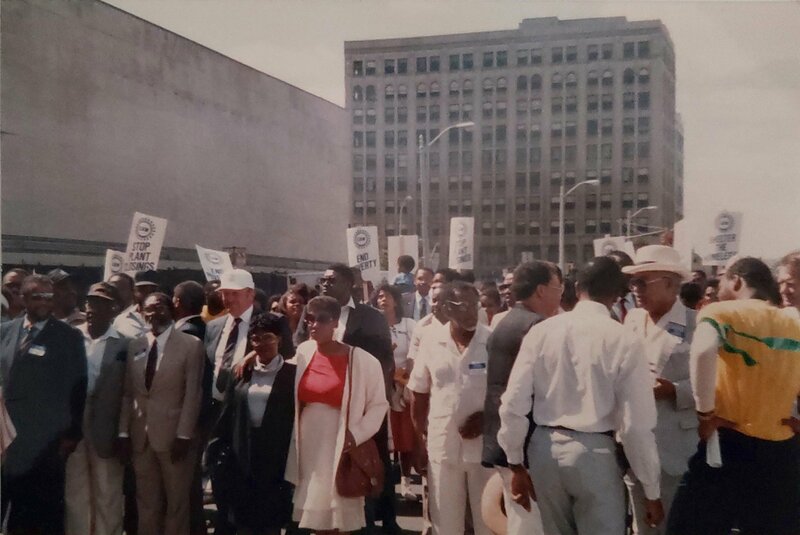 And though I had never been to Elyria, I was connected to that place in the northeastern part of the state, not far from Lake Erie, the place where my grandfather’s American dream took root. 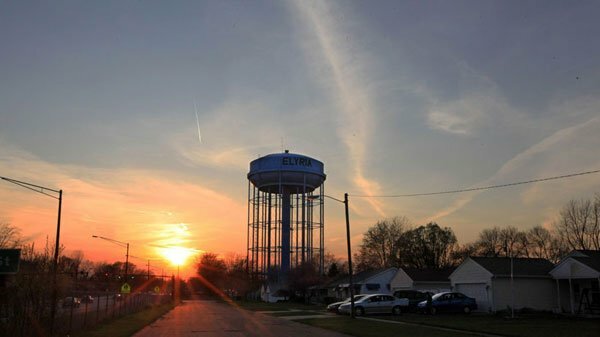 The paper was featuring a five-part series called “This Land,” which explored the history and residents of Elyria to explain the complexities of this iconic American town. The articles painted a picture of the town for me through its citizens: an ambitious mayor; a female diner owner who knew all of her customers and their orders by heart; local sports heroes; people who could have been my friends, my neighbors in another life. But even without a journalists’ words taking me there, I knew Elyria. I had already been there in my mind. I had never been to Elyria for real, though I had my chance. One summer when I was in college, my family met our cousins from Columbus for a few days near Lake Erie. 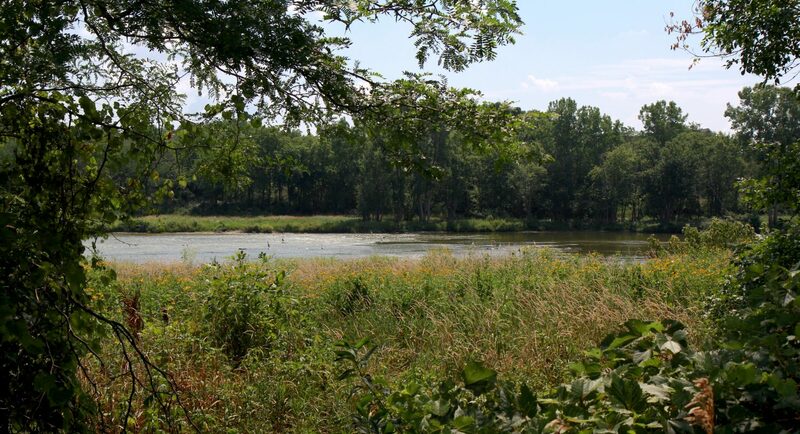 My mom and I drove east from Chicago, and the next day, I had my choice of two day-trip options: a (what I thought would be) lackluster road trip to uncover our past in Elyria with my mom, aunt, and cousin, or a cousins-only excursion to Cedar Point. I chose the amusement park with no regrets, even after witnessing a cousin throw up from one too many rides on Millennium Force, the record-breaking “mountain of metal” rollercoaster whose view took us right over Lake Erie. Why would I visit Elyria? Grandpa had never liked it there. At least, my mom and aunts and uncles told me, he had never wanted to stay. But that night, when everyone was back at the hotel regaling each other with stories, I felt a tickle of curiosity in the back of my mind. I had missed a trip to grandpa’s old house, his high school, a drive around the place that was our beginning, and could have been our present, our ending even, had he never left. Without evidence, I pictured my mom driving by his clapboard home, on the corner of a small subdivision, green manicured lawns and all, beautiful in its Midwestern normality. When I look up his address on Google Maps Street View, I see the house that is there now is actually clapboard, though it sits in the center of the block, not on the corner. A small garden decorates the front and grass grows under a tall evergreen in the yard. I wonder what it all looked like back then, in the thirties. I wonder who I would be, had my grandpa never left. It feels a world away from my apartment building in the center of Chicago, though I know it’s not too far. 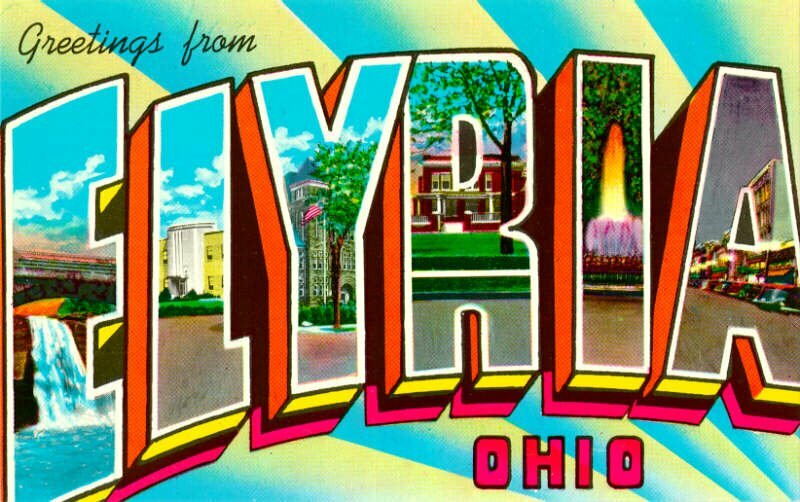 I have never been to Elyria, but I would like to visit someday. Claire Tighe is a Chicago-based writer with a degree in Women’s and Gender Studies from Dickinson College. Her previous work has appeared at RH Reality Check, Bedsider.org, Chicago Literati, and The Feminist Wire. Tweet her about Midwestern things @ecofeminismo.